Oregon City's Carter Nekvapil earned All-American honors after landing on the awards podium twice at the June 30-July 1 USAW Kids Nationals wrestling championships in Atlanta, Georgia. 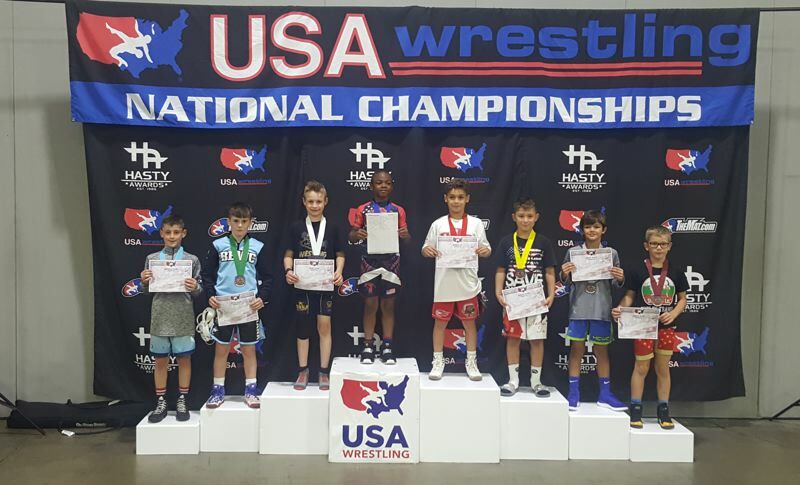 Nekvapil, a fifth-grader at Redland Elementary, placed third in freestyle and finished sixth in Greco-Roman, competing for the Cobra All-Stars in the intermediate 77-pound division. "I went in thinking I would place both days," Nekvapil said. "My goal was to win, but after I lost my first match, my goal to place in the top three." Nekvapil opened the Greco tournament against eventual champion Aaron Stewart of Zion, Illinois, who scored a 13-0 technical fall to knock Nekvapil into the consolation bracket. Nekvapil then won his next two matches to move into medal contention and then lost two in a row, falling to Ivan Ivanov of Boise, Idaho in the fifth-place match. In the freestyle tournament, Nekvapil again drew Stewart in his opening match and lost by a 10-0 technical fall. "Going into the match, I just thought, 'I've just got to try my best,'" Nekvapil said. "If I lose, I lose, and if I win, I win. I thought I could wrestle with him, but I didn't do that good. He was just really strong and he was fast. When he took me down, he got me in a leg lace and won by technical fall." Nekvapil then reeled off three consecutive wins with one pin and two technical falls to advance to the consolation final against Isaac Padilla of Fairfield, California. Trailing 4-0, Nekvapil caught Padilla in a cow-catcher and took him to his back to win by fall with 14 seconds remaining in the first round. The victory clinched third place and also avenged an earlier 5-4 loss to Padilla in the semifinals of the 2018 Marines Western Regional Folkstyle Championships in Las Vegas in April. "They were all good matches," said Nekvapil, who went 6-4 over two days in Atlanta, pushing his overall record to 67-15 with 34 pins. "Next year, I'll be a first-year novice and it's going to get tougher for me, because some of the other novices will be a year older than me and some will be more experienced. But I think I'll do pretty good." Nekvapil, 10, started wrestling five years ago when he and his older brother, Austin, joined the Oregon City Wrestling Club and started working with coach Jim Marshall, according to Tom Nekvapil, the two boys' father. "I wrestled in high school, but I never brought it up because I know it's tough," Tom Nekvapil said. "Then the neighbors were going to try out for the Oregon City Wrestling Club and my wife said, 'Oh, you boys should try it.' They loved it and have loved it ever since. "Jim Marshall runs a great starter club. If we would have gone somewhere else, I'm not sure the boys would have liked wrestling, but Jim has a way of making fun. You're learning, but it's still a lot of fun." The Nekvapils then spent two years working out with coach Kevin Keeney's All-Phase Wrestling program in West Linn, and then switched a couple of years ago to coach Marc Sprague's Cobra All-Stars program. "Every year, I see progress, and with Carter, it's like night and day," Tom Nekvapil said. "From peewee to know, it's incredible. And I've got to thank each of the clubs for that, from the Oregon City Wrestling Club for getting him super-interested and excited about wrestling, to All-Phase for making him really tough, to Cobra for elevating his game from a technical standpoint. "I think all three of the clubs have helped make him the wrestler he is today. My job is just to take him to the tournaments and be 'Dad.'" In preparation for his trip to Atlanta, Carter Nekvapil went to a 10-day wrestling camp, putting in close to eight hours a day and training mostly with kids who were a couple years older and 20-30 pounds heavier than him. "For a 10-year-old, that's a lot, but he has stuck with it," Tom Nekvapil said. "I noticed this year that Carter has taken his game to a whole other level. I've seen a level of maturity not only in his wrestling, but also that he's paying attention a little bit more. "You're thinking, 'Oh, how can a 10-year-old pay attention?' But for him, it's a lot better now than it was at this time last year and I'm impressed with how he's paying a lot more attention and being serious about his wrestling." What is it about the sport that Carter enjoys? "I like working hard, I like winning, and I like getting awards," he said. "It took some time to get good. It took a bunch of practices and a bunch of tournaments." The trip to Atlanta also marked the unofficial end to what had been a nine-month season for Nekvapil, who plans to attend a couple more wrestling camps before shifting gears at the end month when the Oregon City Youth Football Association season swings into action.